Charlie Federico in the South Boston bike shop his father opened in 1938. The Harvard Business School will never do a case study on Federico’s Bike Shop, but it should. Charles Federico, the son of Sicilian immigrants, opened the shop in 1938 on Emerson Street, near the intersection with East Broadway in South Boston. His son Charlie took it over 40 years ago. Charlie Federico ran an unorthodox business. He didn’t post store hours because, the way he looked at it, you knew the shop was open when he peeled back the folding, accordion-like grate fence and put a metal stool on the stoop. The telephone number on the sign out front was merely aspirational, because Charlie did not answer the phone. This drove his wife, Carolyn, crazy. His kids got him a cellphone and Charlie thanked them profusely, then promptly turned it off. Charlie’s attitude was, if you wanted to do business, you should come down to the shop and talk face to face. Charlie Federico would talk to anybody and everybody. He lived for human interaction, trading stories, gossip, bad jokes. He loved seeing kids get their first bike. He made new mothers cry tears of joy when he fixed their strollers. He didn’t need the job. He loved the job. He had worked as an engineer at GE in Lynn for 30 years before taking over the shop. Charlie designed jet engines but wouldn’t fly, insisting he did enough of that with the 101st Airborne in the Army. For all his quirks, Charlie took his business seriously. He was at the shop nine hours a day, six days a week. With its creaky wood floors and every inch covered with frames and wire rims, Federico’s was the mercantile Dorian Gray, because it never changed while everything around it did. Charlie didn’t change either. He was proudly stubborn. While Southie became big and new and polished, Federico’s remained unvarnished and unadorned. Developers appeared at Charlie’s doorway, offering him riches to sell the building. Charlie would sit on his stool, fold his arms, and wave them away. He wasn’t going anywhere. 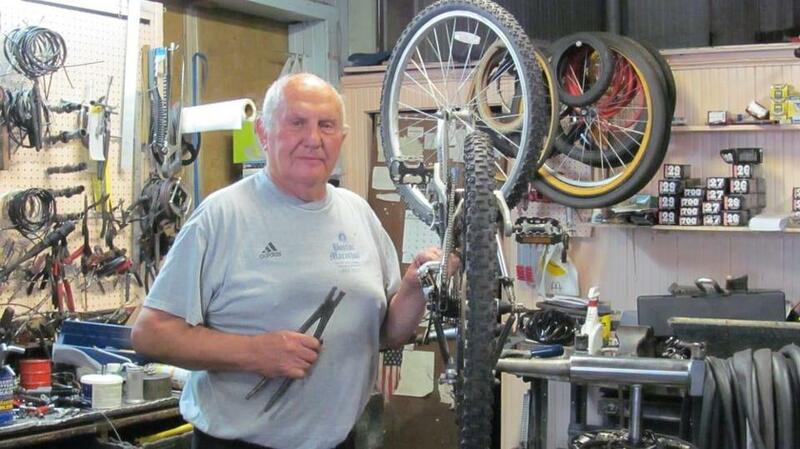 Thirty years ago, when he was 10, Kevin Colvin showed up at Federico’s, his bike chain a mess. And he did. Charlie wouldn’t take Colvin’s money. Thirty years passed and Colvin, like a lot of Southie natives, got priced out of the neighborhood, so he and his wife moved their kids an hour west. Last fall, when his 10-year-old son Nathan’s bike broke, he loaded up Nathan and the bike and drove to Southie. He let Nathan bring the bike in and interact with Charlie, and history repeated itself. Charlie showed Nathan how to fix the bike and wouldn’t take his money. Charlie was very spiritual, embodying the old proverb that if you give someone a fish, you feed them for a day, but if you teach them how to fish, you feed them for a lifetime. Charlie’s business model, often not taking money, always undercharging, giving away trade secrets, is something they wouldn’t teach you in business school. But when he died Sunday, at 86, Charlie Federico was the richest guy in Southie, and it had nothing to do with money. They’re waking Charlie at Casper Funeral Home, from 4 to 8, on Thursday, and the line will be long, the stories so good that Charlie would love to hear them. And, if you knew Charlie, you know that, somehow, he will.